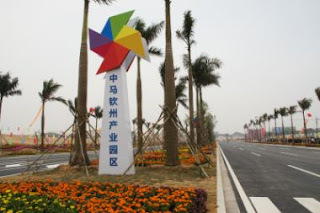 The entrance of the China-Malaysia Qinzhou Industrial Park in Qinzhou city in Guangxi Zhuang autonomous region. PETALING JAYA: The joint venture of SP Setia Bhd, Rimbunan Hijau Group and Qinzhou Jingu Investment Co Ltd will focus its development at the Qinzhou Industrial Park (QIP) on the start-up district. Based on a preliminary estimation, the total estimated cost for the start-up district alone is expected to be approximately 5.4 billion yuan or RM2.6bil. SP Setia said in a filing to Bursa Malaysia that the start-up district spans over 7.87 sq km or 1,945 acres. Qinzhou Jingu is looking for approval from the Chinese government to allow up to 30% of the commercial and residential land in the start-up district to be swapped for another piece of commercial and residential land. This swapped land will have an equivalent land value in the more developed Binhai New Town. The relevant parties will establish the joint venture company in Qinzhou City. It will be named China-Malaysia Qinzhou Industrial Park Investment Co Ltd. The land swap will allow the joint venture company to gain development access to Binhai New Town, which has a total planned area of 110 sq km and a net development area of 45 sq km. According to the Bursa filing, Binhai New Town is designed to be an industrial service centre, seaside tourist resort and high-end residential district. Once completed, the expected future population is 500,000 people. “The proposed development is currently at a very preliminary stage and the total development cost, the expected commencement or completion date of the entire proposed development and the expected profits to be derived from the entire proposed development have yet to be ascertained,” it said. The total registered capital of the company will be 1.8 billion yuan or RM878.05mil, of which the registered capital to be subscribed by SP Setia is approximately 396.9 million yuan or RM193.6mil. This will be funded through a combination of internal funds and, or bank borrowings. The actual mix can only be determined later. The joint venture agreement was formed to develop the China-Malaysia QIP.